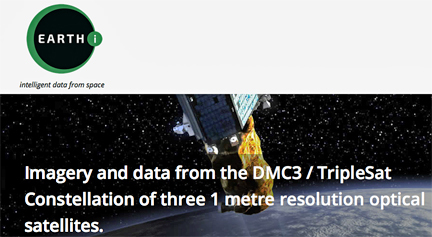 [Satnews] Earth-i announces forthcoming operational data services from the DMC3/TripleSat constellation. Earth-i expects to start offering full operational imaging and data services later this year from the DMC3/TripleSat constellation and will place specific focus on fast, easy and convenient access for data users. Founded and run by prominent and experienced individuals from the Earth Observation industry, Earth-i is located in the UK close to the Surrey Space Centre, and the satellites’ manufacturer, Surrey Satellite Technology Ltd.
Three identical 1m resolution optical satellites comprise the DMC3/TripleSat constellation. Twenty First Century Aerospace Technology Co. Ltd (21AT) acquired the total capacity from SSTL in 2011 during a signing ceremony attended by the Chinese Premier and British Prime Minister. Subsequently, prior to the July 10, 2015, launch on an Indian PSLV-XL rocket, Earth-i signed an agreement with 21AT to become a strategic partner and master distributor. The orbital position of the three satellites means the constellation is able to target any point on the earth’s surface at least once per day providing reliable and consistent information to data users, particularly useful for a wide range of applications including change detection. The unique combination of high spatial and temporal resolution, along with industry-leading technical specifications, will serve data users and support a wide range of applications in market sectors including oil and gas, security and defence, agriculture and construction.